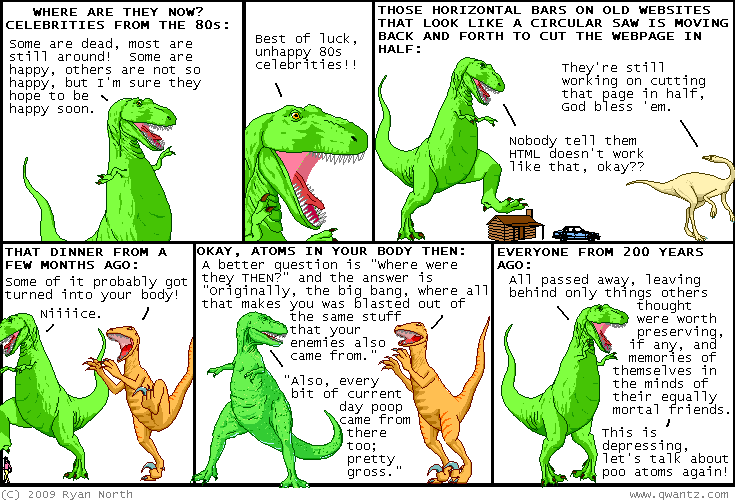 Dinosaur Comics - December 14th, 2009 - awesome fun times! 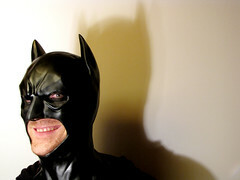 December 14th, 2009: My talented street artist friend Posterchild came into possession of a Batman mask to disguise his identity during a recent talk he gave (which you can see here!). After the talk he thought it would be a great idea to make a series of photographs of all his friends wearing the mask and call it "Superfriends", so we all gathered at his place to watch Turtles Forever and then take Batman photos! The bad news was that Bruce's mask was too big for women, but the good news is that we got a Catwoman mask for them! Check it out, you guys! They're SUCH GREAT PHOTOS. There's also some alternate photos that are also awesome. If you woke up this morning with the question "Holy crap, what would Ryan from Dinosaur Comics look if he dressed up as Batman?" floating in your head, now you know. One year ago today: can you believe i wrote this whole comic before i thought of the phrase "holy ghost"? i can. I JUST LIVED IT! !